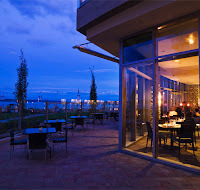 Anchoring the coastal town of Sidney-by-the-Sea on Vancouver Island’s Saanich Peninsula, this boutique waterfront hotel is inspired by the beauty and serenity of its natural Pacific Northwest shoreline. 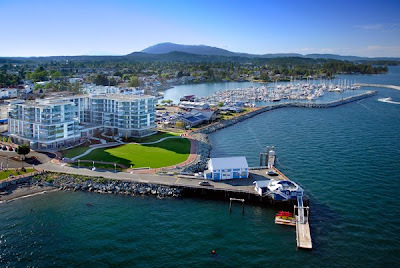 Opened in 2007, the Sidney Pier Hotel & Spa offers guests an elegant and contemporary escape in 55 spacious guest rooms and suites. Guests seeking a quick coffee, fresh baked goods or picnic lunches can visit the Georgia Café & Deli. Meanwhile, Haro’s Waterfront Restaurant & Lounge serves fresh local seafood, slow-roasted rotisserie meats and house-made pasta. Activities range from cycling the Galloping Goose Trail to whale-watching, kayaking and sailing charters. Mingle with locals at the market and pier, tour a nearby winery, or explore over 100 boutique shops, specialty bookstores and artisans’ studios. Haven Spa is a relaxing sanctuary inspired by the sea, providing guests with a holistic approach to beauty and wellness. Indigenous treatments are combined with modern advances in skin care and body therapies to create authentic local experiences for guests. The Haven Spa features a comprehensive array of services, including massage, facials, body treatments and aesthetics. Guests also have access to hair, makeup and nail services in the Haven Salon and 24-hour access to the hotel’s 1,200-square-foot fitness centre.